Psycho Jock can customize medical apparel. We can help you with all the medical apparel your hospital or doctor’s office needs: from uniforms to lab coats to outerwear and everything in between. We can even embroider your hospital’s or office’s logo onto your medical apparel! Call us today to get more information. And, in the meantime, click here to see the catalog order today. Scrubs, lab coats, jackets, pants and more! 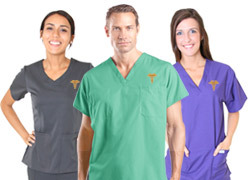 We've got all of your medical, hospital, uniforms, and hospitality apparel needs covered! Check out our order form and let us know what you're looking for.